Recently we met Jim, a real life 26-year-old soon-to-be-bankrupt man. He’s a typical Joe, err… Jim, working his way (slowly) through college, working a part-time job, and trying to make ends meet each month. I should mention that Jim’s parents have been bankrupt for many years now, and they’ve taught their son everything they know. Alas, the apple falls not far from the tree. In the last episode of his life, we witnessed his disastrous mistake in dealing with an insurance company. Let’s see what surprises he has in store for us today, shall we? Hi Jim, how’s it going? College classes just started for you again, didn’t they? 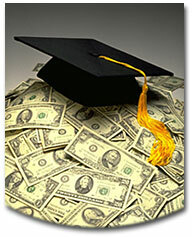 Jim: Yes, they sure did, which means it’s that time of year again – time to collect my student loan money! In fact, I just received the check a few days ago. I see. Jim, like a significant amount of people working their way through college, has a growing amount of student loan debt. Like a mortgage, student loan debt can be considered “good” debt, unlike debt owned on high-interest credit cards or car loans (shudder). So, Jim, I suppose most of that money is going toward tuition and books? Jim: Ha! Right. Only what’s necessary will go toward that junk. The remainder is mine for the spending! Moneymoneymoney, what shall I buy? What? You mean you’ve already spent some of it? Jim: Heck yeah! First of all, I gave my landlord several months of rent in advance. I don’t want to forget about it, you know? Then, I bought a Sony PSP so I can game on the go. Oh, and my computer was a couple years old, so I needed to upgrade it so I can get this new, awesome video game that’s coming out soon. Hey, and I’m thinking about buying a Playstation 3 with a new, flatscreen TV as well. That will be sweet, but that will probably clean me out of extra money. Oh well, it’s totally worth it. Sigh. Let’s see, in how many different ways is Jim’s line of thinking flawed here? First of all, I understand that he does not want to have to worry about rent payments for while, but c’mon, how difficult is it to pay your rent on time each month? What Jim completely and utterly lacks is a sense of how to compartmentalize the dollars that he has. If he wants to allocate a large chunk of change to pay his rent, that is fine. Simply put that money in a high-interest savings account and withdraw the needed amount each month. That way, he can earn a few extra dollars in interest. Instead, he’s allowing his landlord to earn that interest! And people like Jim, who have no capacity for compartmentalizing cash, only see potential purchases with they money they have. Second of all, he’s spending the extra money that really does not belong to him. Student loan money comes at a price, and my guess is that his loans are unsubsidised, which means they are swelling with interest as we speak. He is going to have to pay those loans back one day, whether or not he graduates, and blowing the money on gadgets for his entertainment is more than stupid. It’s… well… the kind of thinking that sends one straight to the seventh circle of hell bankruptcy. Instead of blowing his money on expensive (but entertaining!) gadgets, he could have set that extra money aside in a savings account as an emergency fund, or perhaps even starting paying back his ever-increasing loan debt. Wasting it on gadgets and flat-screen TVs is the worst thing he can do. Don’t get me wrong – I’m not against enjoying life in the slightest. My wife and I have many indulgences for which we feel justified in spending some extra money. For instance, we buy mostly organic food, and you will never hear me advocate a ramen noodle diet (ugh!). However, there is a big difference between enjoying life with a sense of financial responsibility and enjoying life while foolishly blowing every dollar you have (and locking yourself into further debt).